Nexus 6 vs Galaxy Note 4: which phone tops the chart of 2014? The Nexus 6 with its 5.96-inch display should really be considered a phablet, and what comes to mind when the word phablet is uttered? Samsung, of course, the company that coined the term. 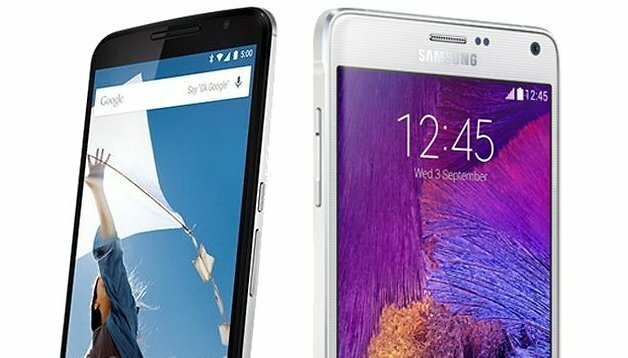 Here is our comparison between the Galaxy Note 4 and the Nexus 6 where we look at which QHD-packing Android phone comes out on top! The Nexus 6 and the Note 4 belong to the 2014-2015 generation smartphones with a metal frame. The main weakness of Android phones’ has long been the choice of designs and materials, aside from the HTC One (M8) and the Sony devices since the Xperia Z. This is of course subjective, but I feel that Android phones are really getting nicer this year. The Note 4 and the Nexus 6 were able to squeeze out of the ugly mold and are both quite elegant. The Nexus 6 was crafted in the image of the Moto X (2014), aside from it being bigger and including a few changes: the volume and power buttons have been moved down, the same goes for the camera and the flash, though they remain in the middle of the device. The Galaxy Note 4 has a plastic backing with an aluminium frame, and has the same physical Samsung buttons that we’ve become accustomed to. One point in which the Nexus 6 is better than the Note 4 is that the Google phone is water-resistant, while the Note 4 is not. What it lacks in water resistance though, it make up with the included S Pen stylus which fits snuggly into the chassis. In terms of resolution, the Note 4 and the Nexus 6 are almost identical: 494 ppi (QHD; 5.96-inches) for the Nexus, and 515 ppi (QHD, 5.7-inches) for the Samsung. Though both devices are equipped with the same great Super AMOLED QHD resolution (2,560 x 1,440 pixels), by having different sizes screens this makes the density differ. When putting both screens side-by-side, the results seen were a bit disappointing. Despite being set to maximum brightness, the Nexus 6 is clearly darker than the Note 4, the latter on the other hand has great color depth and contrast, without being oversaturated. To be fair, the Nexus 6 also has great colors, however in comparison to the Galaxy Note 4, there is only one winner, and that being the Samsung phablet. The Nexus 6 runs Android 5.0 Lollipop right out of the box, and has since received an update to Android 5.0.1 to fix some bugs from the first version of Lollipop. The Galaxy Note 4 is still running Android 4.4.4 KiKat however, it's very near to getting Android 5.0 Lollipop seeing as it is expected to arrive to the phablet in December OTA. Right off of the bat, the main differences are TouchWiz and stock Android: TouchWiz is full to the brim with features while stock Android has all the basic needs, but in a very refined way. Some of the features that Samsung offers are very well implemented, like the camera features and gesture controls. The stock Android OS on the Nexus 6 has many new features thanks to Android Lollipop, like Battery Saver, Ambient display, Tap and Go for quick NFC transfer of data from old to new smartphones, new notifications and multitasking features etc. These functions make stock Android not feel so bare-boned as it might have felt in the past, however with the Note 4 closing in on the Andorid 5.0 update, it won't be long before the Samsung phone has all of these as well. The Note 4 is also a step ahead of the Nexus 6 with its S Pen stylus which is great for smartphone operation. The stylus also comes with its own set of features that are activated when you pull it out. Also, lets not forget the finger print scanner and the heart rate monitor which are also found on the Note 4. Both devices come with top notch processors and stunning QHD displays. However just like the LG G3, such a demanding screen often has an effect on the overall smoothness of a phone's performance, especially when playing HD games. This was noticed when playing games on both either device. However, for the most part, everything ran impeccably for either device, apps opened right away, animations were crisp and what can be observed are two of the best performing smartphones around. There was no clear winner in this section. The Nexus 6 was finally able to break away from the poor camera quality that plagued previous Nexus phones and does a standup job with its 13MP back shooter. Motorola also included the optical image stabilizer. The benefits of this technology could be seen in the results: images taken in low light situations turned out great and offer little noise. The Galaxy Note 4 on the other hand has a higher resolution rear camera of 16 MP, in addition to an ISOCELL sensor, an optical image stabilizer and a long list of shooting modes. It's also interesting to note that that either device was treated differently in terms of front camera resolution. The Nexus 6 only comes with 2 MP on the front, while the Note 4 has 3.7 MP. Samsung clearly understood that the current selfie trend in adopting a better camera on the front. They also included a neat feature which allows users to use the back facing camera to take selfies which uses the heart rate monitor as a sensor. Take a look of our comparison picture below where we used the back facing cameras on either phone. The Nexus 6 has a battery with a capacity of 3,220 mAh: even if you consider that the larger, more battery-sucking display than on the Nexus 5, the leap in battery capacity is still quite impressive. That being said, the Note 4 meets it eye-to-eye with 3,220 mAh and with the screen is slightly smaller, the Samsung phablet is sure to have a longer battery life. The battery is also exchangeable. When testing out the Nexus 6, there was no problems of quick battery draining and there was more than enough juice to get through the day. In our test, we used the Nexus 6 for 27 hours during which we did all what a normal user would do, it there was still 17 percent remaining. When testing the Note 4, we found that the Note 4 was also more than satisfactory. Both devices come with their own battery saving technology: the Nexus 6 has Battery Saver will limit the heavy tasks that your phone usually does. For example, there will be no more haptic feedback when pressing on keys, background data will come to a screeching halt, and apps will no longer sync, amongst some other things. As for the Note 4, it comes with not one, but two battery saving features, those being Power Saving Mode and Ultra Power Saving Mode. The first mode will disable haptic feedback as well as limit CPU and screen performance. Utlra Power Saving Mode on the other hand will get rid of the colors on your display and apply a grayscale to your user interface. It will also limit access to apps, turn off Bluetooth and Wi-Fi, as well as mobile data when the screen is off. It is so good that you could get another week of battery life with this turned on the entire time if you really needed it. Both the Nexus 6 and the Note 4 perform well in this section, however the Galaxy Note 4 with its Ultra Power Saving Mode comes out slightly ahead. The Nexus 6 will be sold for 649 USD off-contract for the 32 GB variant, and the 64 GB model will cost you 699 USD. Despite the high price, in comparison to the previous Nexus phones, the Note 4 is even more expensive at 855.00 USD unlocked, but if you get it with a carrier you would obviously pay a smaller amount upfront and monthly installments. The Nexus 6 is the first time you can also get a Nexus phone with individual carriers, in addition to purchasing it through the Google Play Store. At the moment, it is currently out of stock in many regions. The Nexus 6 is shaping up to be a great phone, though the price is a little expensive for what we were hoping to see. The reason for this is clear: it has a great QHD AMOLED display, a super-fast Snapdragon 805 processor, 3 GB of RAM 3,220 mAh battery and runs Android 5.0 (now Android 5.0.1). With these specs, it meets the Note 4, and still comes out costing less. The Nexus 6 is also water resistant, while the Note 4 is not. On the other hand, the Note 4 has better cameras (both front and back), an S Pen, fingerprint scanner, heart rate monitor, a removable battery and a micro SD slot, not to mention more features, an Ultra Power Saving mode. The Samsung phone will also soon be updated to Android 5.0 Lollipop to clear up that gab between the two devices. Though it does come down to taste and preference, which design you prefer, a Moto X look-alike or a typical Samsung device, both with aluminium frames, we have already crowned the Galaxy Note 4 as the best Android phone of 2014, though the Nexus 6 isn't far behind. Which phone do you think is better? "Though both devices are equipped with the same great Super AMOLED QHD resolution (2,560 x 1,440 pixels), by having different sizes screens this makes the density differ." Incorrect. Only Samsung devices features the Super AMOLED technology. Which explains why the screen looks better on the Note 4 compared to the Nexus 6, even with the same resolution. The Nexus 6 has too many deal breaker features missing, making the choice easy for the Note 4 taking the crown. During it's launch, the Note 4 could be had for less than the Nexus 6 with Samsung's Pre-Order promotion. Got my Note 4 for $550, as it retails here in the US for $749.99. It was $200 off with the limited time promotion. Well then I guess you can wait for years begging for an android update and lagging is definitely an icing on top of the cake. Thats what samsung is. What samsung does with the display is just oversaturation. The colours are just too much and surprisingly it does the trick with guys like you who thinks its a better display. Ofcourse the colours are not natural with samsung phones. Its just too much colour. But ofcourse colours looks good with the eyes. So it depends on whether you need natural colours or abit too much colour for everything. Well the technology is definitely amoled and samsung calls it super amoled in their phones. Samsung will always be known for its LAGwiz and Slow updates. Simply thats why it is going down. does the N6 proc fall from 2,7 to 1Ghz too when stressed? No doubt in my mind, the Galaxy Note 4 is the king of smart phones..... I do believe that it will be hard to beat for the next year. I will not upgrade for at least two years. Sure you might get a little better battery life and maybe even a little faster processor and stronger glass but not enough to warrant an upgrade. It will take some really tremendous upgrades to make it worthwhile to upgrade. I am going to wait until I can test both devices (in a Carphone Warehouse shop) before deciding which one to go for.... Interesting to hear the stereo speakers on the Nexus. Not to mention the QHD screens on both. One thing in the Note 4's favour is you can replace the battery when it starts to deteriate.. Made a big difference to my Note 2, running kit kat. Nexus 6 had ticked all the boxes but they forgot ONE MAIN THING.. SD card slot. Had they included that it would have been awesome but hey its Google Nexus 6. They are not fan of Sd card slot that is why they screwed up Kitkat. I really hope Android L fixes that annoying thing. Note 4 on the other hand is a complete device. S-pen, fast charging, Sd card slot, super fast processor, 3 GB RAM, 16 Mp camera, good selfie cam. It has everything. Complete device that ticks every box that you need. I am not a swimmer or don't use phone in water or anything to do with water. So water resistant is not a big deal for me. Its definitely not a deal breaker for me but not having SD card slot is serious thing. thats me. May be others might be ok with Nexus 6. I totally agree with droidmanX. The issue I have with Nexus devices is if the line is suppose to showcase the best and all there is about Android then why is it they refuse to add an sd card slot. Not everyone wants their stuff on the cloud and there are times when you may not have a mobile connection. Folks continue to request sd cards and even HTC backtracked and added them back on their devices. Android has had the capability for stylus support since ICS and yet not one has come out with the Nexus line. If it is suppose to showcase everything that Android offers then add it or include it. Then let folks decide if they want to buy a stylus for it or buy an sd card. Until then, Samsung will continue to outsell them and be on top of the phablet market. And in the article you mentioned card slot things in performance.Lol...external storage actually reduces the performance no matter how good is the memory card. Screw Samsung and their crappie software. Almost, 2015 and their SlowWiz still lags, WTF. Not even my HTC One M7 knows what lag is. Hey Loie.. got some errors in the article, eg, Note 6..
You might want to edit your article.. The Google page for the nexus 6 says that it's also an AMOLED display, not ips lcd. The article still need to be corrected. The Nexus 6 isn't Super AMOLED. Super AMOLED is exclusive to Samsung, as it's their display technology. Stock Android rules!!! I wouldn't buy any of them because they are the size of my hand but if I had to choose between them I wouldn't even think of buying the note 4 because TouchWiz is simply ridiculous. It's pretty much plain and simple nothing beats Samsung or the Galaxy Note products they are the GOLD standard of technology today. It's SAMSUNG who made this category prominent four years ago Apple just realized who was boss and came out with their 2012 fake wanna be phablet. And now Google has followed suit with it's bootleg version of a phablet. Bottom line nobody needs a featureless dull run of the mill boring day to day smartphone experience which is all the Nexus 6 offers. Why have a big screened smartphone with NO PURPOSE or true multitasking/productivity abilities it serves no legitimate significant purpose. The Galaxy Note 4 wins so easily it's comical especially in the battery, storage, camera front and back, as well as the most important point features. Google and Apple still are experimental rookies in this space Samsung is the KING of phablet country nothing else will ever matter or compare. Richard! Good to see you. I hope you return to Google+. It isn't the same without you. Glad to see you continuing to champion the Samsung cause lol. Google may be a rookie in the phablet space, but that really is inconsequential. What they are doing is appealing to a segment of consumers who, because of Samsung, exist and want options. Android L will be lightning fast on the N6 and will run laps around the bloated TouchWiz of the Note 4. Gold standard!!! You are so funny man :D Samsung is so cheap and everyone knows that. And right now it is struggling to keep up with the losses that it is facing. Samsungs rise to the top was when they introduced low cost android for everyone. But that time the people had no other phone to choose from at that price range. But today the standings are different. We have much better phones at all price range with better performance. People dont want to take risk buying a heavily customised phone and experience lag or such a cheap quality phone. Samsung has lost most of its shares and its still continuing to lose. Completely agreeing with you. Samsung wont make a comeback from the heavy losses that it faces now unless it throws away Touchwiz.